Each year is, on average, 365.25 days (with two places of precision). So, if uniformly distributed, today is the birthday of 1/365.25 of the population! I wouldn't say 4/1461, because 1. We lose the fact that we're dealing with an imprecise number, and 2. It's harder to see that and tie it to the fact that a year is about 365.25 days long. I will travel back in time and fight my elementary school math teachers now. each year is actually 365.24 days, with two places of precision, on average. we don't use the julian calendar anymore. Yes, a fraction is a rational number. Is this actually true? 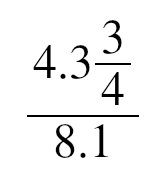 1/(2*pi) seems like a perfectly reasonable fraction to me. My intuitive feeling is that a fraction is just one quantity divided by another quantity, no matter the set membership.